In New Poll, Support For Stricter Gun Control Law Drops Since Newtown Shootings : The Two-Way Forty-seven percent said they supported stricter gun control laws. That number was 57 percent just after the shootings. 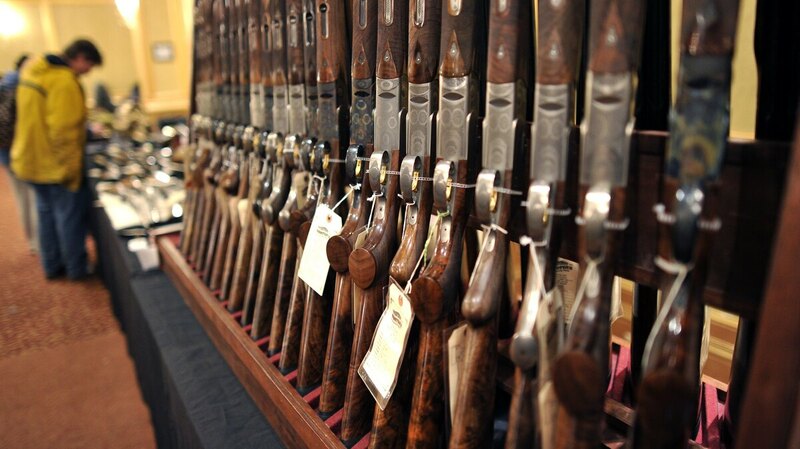 Shotguns sit on display at a gun show in Stamford, Conn. in January. In the months following the school shooting in Newtown, Conn., polls showed greater support for stricter gun control laws. "Currently, support for stricter gun control laws stands at 47 percent today, down from a high of 57 percent just after the shootings. Thirty-nine percent want those laws kept as they are, and another 11 percent want them made less strict. "Partisans hold different views on gun control laws: 52 percent of Republicans want the laws kept as they are, while 66 percent of Democrats want stricter laws (down from 78 percent in February). Half of gun owners themselves want gun laws overall kept as they are, but a quarter call for stricter laws." This poll comes a week after Senate Majority Leader Harry Reid, a Democrat from Nevada, announced he was stripping a gun law bill of a provision that would ban assault weapons. The findings of the poll, however, are pretty much in line with what Pew found shortly after the shootings. As Mark reported at the time, their bottom line was that the "public's attitudes toward gun control have shown only modest change in the wake of last week's deadly shooting at an elementary school in Newtown, Conn."